Lesley Uebel has notified users of this site that she has been hosting for over ten years of a change of URL http://www.claimaconvict.net/index.html is the new address. As one who has claimed a few convicts and made some valuable contacts over the years I thank Lesley for her tireless efforts. I might be tempted to join these Camden ladies as they remember female convicts. My ancestor Ellen Moore (Mariner), wife of Patrick Curry (Hooghley), lived on the Camden Park Estate. In the AUS-NSW-PENRITH Rootsweb list Lorraine Stacker outlines a number of events that have been planned to celebrate this event. Full details can be found in Lorraine's message. Our friends across the ditch are making use of GPS technology. From 1 August to 9 August 2009 we will be celebrating in Australia. I just took a look at the National Family History Week website and have found lists of events that are to take place in most states and territories (come on NT and Tassie). The events page will tell you what is on offer in your area. Family Sites. 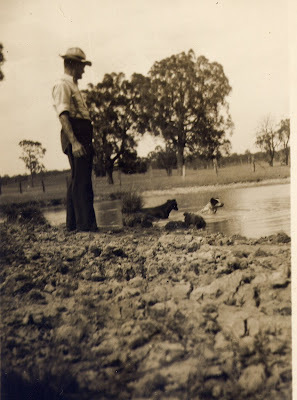 Whenever I find a website, maintained by an Australian, either devoted to the genealogy of a particular family or surname I tag it in Delicious with the tag familysite. I also tag any similar sites from overseas that have links to my family. If you are considering creating a website you may wish to look at these sites for ideas or you may just wish to browse them to admire the work done my fellow family historians. Perhaps you'll discover a distant cousin. If you don't have a Delicious account you may wish to sign up, - it is a free social networking site that thousands of people use to store share and discover websites online. It is one of my favourite tools. I subscribe to the Word of the Day RSS feed from Dictionary.com. I know about 8 out 10 of the words that appear but every so often I learn a new word to enrich my vocabulary. The Word of the Day on the 21 July, sedulous, was particularly relevant to genealogists. It is somehing I aspire to be but, sadly, am not. If only I had been more careful in recording sources years ago I would not have to be going over my files and spending time checking information and trying to recall the sources of some snippets. Are you sedulous in your approach to family history? Follow this link for an explanation of sedulous. My second cousin once removed is in the news. Although I have never met Melinda I follow her activities with interest. It is interesting that we were both educated at the same school, Vinnies, in Sydney. If you are a genealogist who hasn't yet entered the world of blogging this article provides a good overview. A day of lectures relating to Castlereagh, NSW. Since December 2007 I have travelled with a little eeePC in my handbag. I also use this lightweight computer when sitting in bed reading my RSS feeds and browsing the internet. I have a full copy of The Master Genealogist running on this little beauty. I am wondering if it is time to upgrade to one of the newer models with a bigger hard drive onto which I could back up my photos when travelling. Check out the latest models. Please help this Masters Student with his research on Australian Genealogists by completing an online survey. Fellow Females....how do you behave online??? Turn your old computers into useful tools. Need a Bumper Sticker to show your hobby? They are now available in Australia. I, too, jumped on the Genealogy Wise bandwagon very early and have watched its amazing growth over the past couple of days. As many genealogy sites and blogs are US centric (due to their huge population) I thought it would be appropriate to have a general group at this site just for Genealogists in Australia.... a spot for general discussions. Last night I set up a group Australian Genealogists, did a quick search for Australians who had joined the Genealogy Wise site (found 14) and invited them to join the group. As of this morning the group has 13 members. By the time I return from my weekend away I expect that the group will have grown. I am now thinking of defriending some of my genealogy contacts on Facebook and saving that resource for communication with friends and family..... I'll take a 'wait and see' approach and evaluate that idea in a few weeks. If you are an Australian with an interest in Family History please join us at Australian Genealogists. Downunder ..... they WORKED hard for the family. Australia is known as the country that grew up on the sheep's back. Many of our ancestors worked in rural locations in the Australian outback. The men worked outdoors whilst the women maintained the house and cooked three hearty meals a day for those hardworking men. 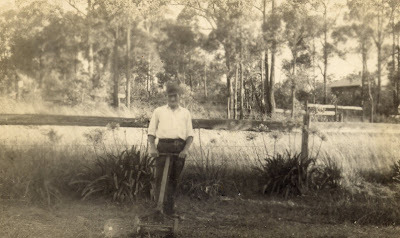 Ernest Gillespie mowing the property in Arcadia, NSW. 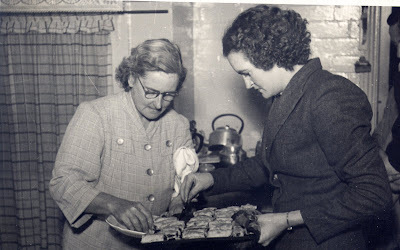 Eliza Anne Gowans (left) testing her sausage rolls in the kitchen. This post has been prepared as part of the 15th Edition of Smile For The Camera is "they WORKED hard for the family." After years of procrastinating I have taken the plunge and registered a Domain name, bought some new software and organised some web hosting. The genealogy I had on the internet was in the form of static pages. I wanted a tool with Web 2.0 capabilities that would apply varying levels of security, enable others to access and edit information on my site and be easy to manage. Initially I tried to use MyHeritage but I found this rather inflexible and the recent increase in costs forced me to look around. I wanted a tool that I could control. In the course of my research this week I found The Castellorizo Genealogy Pages: A Greek Island Family History Website which seemed to be using the type of application I was wanting. I found a link to the software developer on the site and went exploring. The Next Generation of Genealogy Sitebuilding ©, written by Darrin Lythgoe was powering the site. After some time spending a couple of hours exploring sites produced using this tool my mind was made up - the $US29.99 price tag made the gamble affordable (it cost me $AUD38). Their site claims "The Next Generation of Genealogy Sitebuilding© ("TNG") is a powerful way to manage and display your genealogy data on the Internet, all without generating a single page of HTML. Instead, your information is stored in MySQL database tables and dynamically displayed in attractive fashion with PHP (a scripting language)." Hosting was the next issue. Once again I took a gamble and went with one of the hosting services suggested by TNG. Within less than half an hour my domain geniaus.net was registered and I was able to access my site. Simply Hosting host a number of TNG sites and offer to install and set up TNG as part of their service. The price was right so I signed up. I requested that Simply Hosting set up my site and was informed by their efficient online ticketing service that it would be done within 24 hours and it was. It took me less than an hour to complete the setup process last night, upload my Gedcom file and start to personalise the site. I've lots of tweaking to do and lots of learning ahead but I've made a start at www.geniaus.net. I will continue to use The Master Genealogist to maintain my database but TNG is providing a new public face for my data. “Every man is a quotation from all his ancestors.” Ralph Waldo Emmerson. Post of interest to those with Greek ancestry. The latest (July) edition of the Federation of Family History Societies Ezine is now online. Genealogy can be complicated but persistence pays off. It's a little hard for an Aussie to write about Justice and Independence with a US slant so I will talk about an Australian who served Australia in two world wars and contributed to the just society we enjoy today. 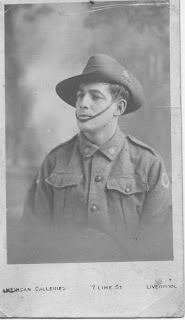 Twenty-two year old Frank (Sonny) Duncan, Service Number 4767, joined the AIF in Dubbo, NSW as a Private on the 2nd November 1915. Previously Frank, the son of Frank and Harriet Duncan, had worked around Cobar doing various labouring jobs on farms and in the mines. Frank embarked from Australia in March 1916 on HMAT The Star of England and landed in Egypt in April. Details of Frank's undistinguised service record in Egypt, France and Englaand can be found on his digitised WWI military file at National Archives of Australia site. Frank returned to Cobar in 1919 where he met WWI widow Ethel Chatfield (Nee Pusell). They were married in 1922 and produced five daughters. Frank and Ethel initially lived on their station "Elsinore" outside Cobar but, when it came time for the girls to go to school they moved into town. 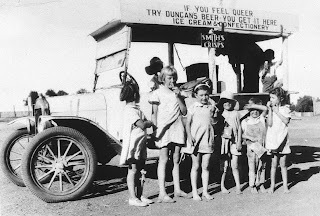 Frank and Ethel had a shop in Cobar and Frank also had an ice cream/catering van that he took to local events where his catchcry was ""Try our home made pies - warm your belly for threepence". The girl behind the wheel in Frank's van, his daughter Lillian, is now 80 years old. Once the girls grew up and were seeking employment the family moved to Sydney where they settled in Kensington. Frank worked for the local Post Office. Not long after World War Two broke out Private Frank Duncan, Service Number N74211 enlisted in the Australian Army in Sydney on 10 Aug 1940 . Frank's term of service in 2 Garrison Battalion was less than one year. Frank, aged just 53, died at home in Kensington in August 1948. One wonders if the conditions Frank faced when defending his country and The British Empire contributed to his early demise. Frank was an ordinary bloke, a bit of a larrikin, the "Dadda" who gave his girls a happy upbringing and a secure home environment. He contributed to the charmed life I lead in "The Lucky Country." I am sorry that I never got to meet my grandfather.